Each suite is $118.00 plus tax. Credit Cards and Cash Accepted. Check in is after 3:00 PM and check out is 11:00 AM. The beautiful Silas Gardiner Suite is located downstairs and features a king bed, single bed, and a private bath with a tub/shower. 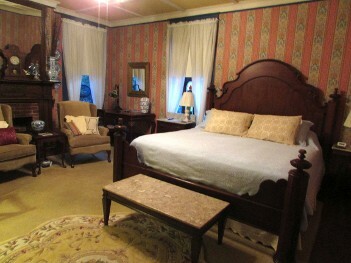 This was the original bedroom of Silas Wright Gardiner and his wife, Louisa. 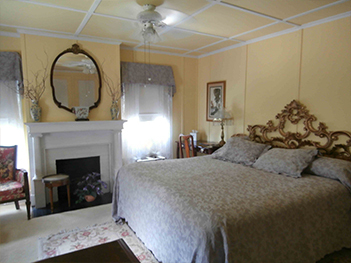 The Wisteria Suite is located upstairs and features a king bed, private bath with a tub/shower. 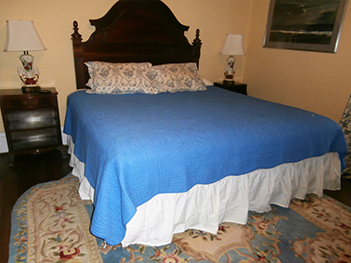 The comfortable Magnolia Suite is located upstairs with a king bed, private bath with a tub/shower. Each suite features a king-sized bed (the Silas Gardiner Suite has a king-sized bed and a single bed), Egyptian Cotton linens, a large flat-screen HDTV with cable, free high-speed Wi-Fi ( house wide), private bath with tub/shower, ceiling fan, desk, hair dryer, iron, ironing board, central air/heat, and a comfortable sitting area. A refrigerator, coffee pot, and microwave oven are available to guests. Complimentary beverages are also available. come and enjoy Laurel's history. The Lauren Rogers Museum of Art, Mississippi's oldest museum, is located on the opposite corner from Wisteria Bed and Breakfast, the lavender house. Sarah Elizabeth Gardiner Eastman, wife of Lauren Chase Eastman and sister of Silas Wright Gardiner was the grandmother of Lauren Eastman Rogers. Wisteria is located a block from downtown near Restaurants, Shopping, Churches, Courthouse, Gardiner Park with Walking Track, Daphne Park, Laurel Little Theatre and the Amtrak Train Station. Visit Veranda and Courtyard by clicking Button Below.